I actually love the Appleseed kelp I'm amazed at how wide and far you planted it tbh. Not only that, but I'd really like to find out the glitch behind deadly armor stands. Can't seem to find anything so far. Found it by trial and error, if anyone is interested. Basically, don't try to knock down stands that are holding armors equipped with the Thorns enchantment. Remove the individual pieces first, then knock down the stand. In hindsight, makes total sense. In the moment I was freaking out that my clothes were killing me. LOL That's fantastic. I wonder if it's been like for a while and we just never noticed, or if the "thorns" enchantment only recently started applying to anything wearing it like armor stands. Poked my head in a bit this weekend. All the new underwater goodies are fantastic. One small glitch in that it looks like the SW corner chunk of the 4 the ring my area out west got nuked. Nothing important got lost, but don't mind me if i go mad with TNT to take out the Cliffs of Jeb nearby. Even found me a sunken ship and a treasure map. Last edited by Elysium : 2018-11-11 at 18:18. Wow did I miss a lot. Had a bunch of personal stuff going on in my home here so I was "off grid" for a bit. Thanks for the notes Brad. Part of the glitchy that was going on was my FiOS connection was dropping multiple times a day. Had techs out here fix it and I've only dropped once in the last week or so. Other than that the hardware/VM has been good. So, I've been back on the Minecraft server a bunch more over the last week. I've really had the itch to fix up and build out some things in Bradtropolis, which I'm still poking around with. But this last weekend, I had a first! I'm sure all you guys have seen this happen plenty of times before, but I had never experience the sudden thunderous spawning of the four horsemen of the apocalypse as I was walking around downtown. Since it was in the middle of the day and most of them were stuck on an awning overhang thing, it didn't take long to pop 'em with a couple arrows and watch their little skullcaps catch fire. I magic'd in a few nametags and saddles and took them to the fenced-in paved lot behind the brick Lulu building for safe keeping. Free to a good home if anyone wants them! Also, I think yesterday I fixed a mild goof-up on my part regarding the resource pack. Apparently the server was still pointing to the old 1.12 version. It should now be pointed at the latest and greatest 1.13 version, and I'll try to make sure it stays up to date. You can ride the skellie horses underwater now (since all undead mobs sink in 1.13), so that's kind of fun. And yes, the first time I encountered a skellie trap it scared the bejeezus out of me! Jess and I got hammered by one a few months ago. And, yeah, what Grey said. Also, all my horse are imbisible! Last edited by kscherer : 2018-11-29 at 13:27. So, is the resource pack for 1.13 a thing? Edit: Never mind. Grey got me square. Last edited by kscherer : 2018-11-29 at 18:26. 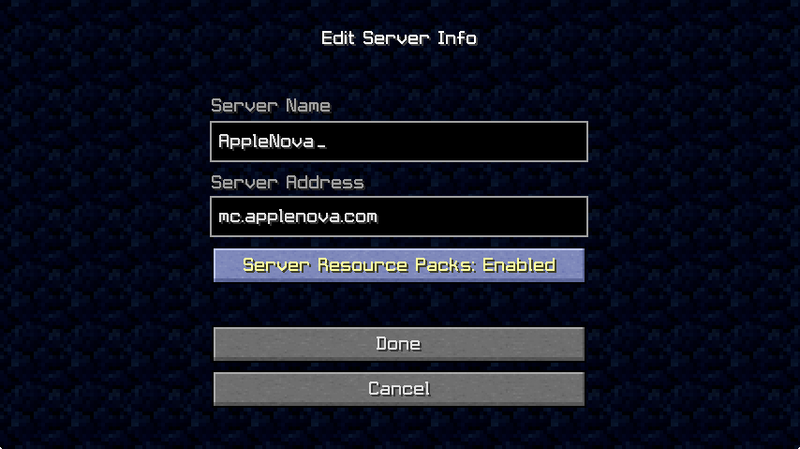 If you leave the setting on to use the server's resource pack instead of your own, it should all work automatically. That also guarantees you'll get updates when I post them without having to fiddle with downloads and files. I have that enabled. Interesting, I could not see my horses until I installed the pack (which I had to do manually). But, all is good. I can see my horses, now. Hmm… 🤔 I'll do some experimenting tonight to see if something is wonky with the server pack configuration. Ideally, none of us would use the downloaded pack (myself included) since who knows how out of date it could be. Huh! Well, it looks like you were right. The server resource pack is not being loaded correctly. I'm going to fiddle with settings for a while and see what I can fix here. I just logged on and the pack downloaded. Works fine here. AUGH. I've been fiddling with the settings all afternoon, and I finally realized where I was a big dummy. I have fixed the pack and server settings, and it should be correctly serving the info to load the pack on demand. Sorry! FWIW, among other problems, because MC uses a JVM with bad default certificate authorities, I can't really serve the pack from this domain (applenova.com) any more. The new certs I'm using aren't recognized as valid by Minecraft. So, for now, I'll be throwing my packs up on https://minepack.net/ for free hosting. I appreciate that the island in this purple chunk was saved during the update as I didn't show up in time to highlight it! My character was camped out there too for the last several months. I have a cave structure built there. However, that's a lot of sea that I'm not partial too. If it makes sense to relocate the island and let some other land pop up there (not sure the magicwork that requires), I'm all for it. Or if that's not possible, I could mine my cave structure for all the stone I want to use elsewhere. Or is it impossible to alter the map now? You know… it's a funny thing. That chunk was pruned as part of The Great Upgrade Purge, but when I traveled the perimeter of the saved world to see if everything looked right, I noticed that there was a curious entryway stuck right on the edge of the saved chunk. I though to myself, "well that's interesting... I wonder if someone was starting to build there," and I went to dig out the chunk from the last backup. Sure enough, there was something beyond that entry inside the island, but I had no idea whose it was. 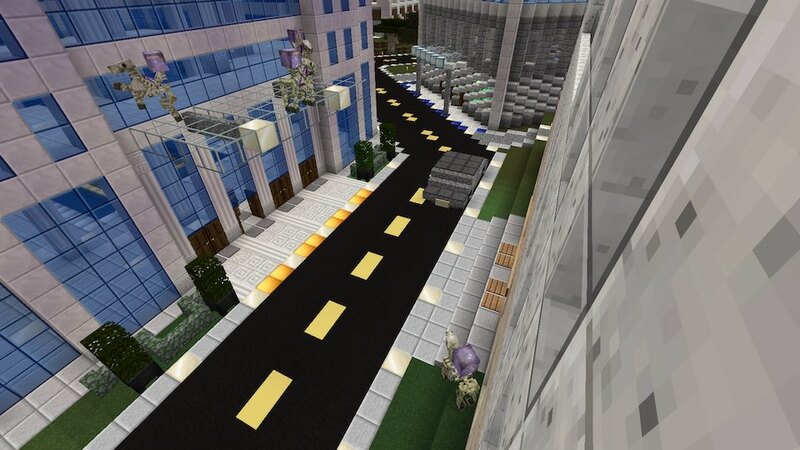 I decided to keep the restored chunk, but I totally neglected to mention it on the forums. I'm glad I let the curiosity get the best of me! As for moving it around, that's not easy (much harder than the good old days of bukkit and WorldEdit), but it's not strictly impossible… depending on how much we're talking about moving. Next time you're online, would you walk about, maybe dirt-tower-up if necessary since this is near water, and get some X/Y/Z coordinates for opposing corners, and I'll see how hard it might be to grab. Were you thinking about moving all the way down to bedrock, or just the "surface" area above sea level? And any thoughts on what destination area you might like to move it? I'll do some measurements this week to get an idea. 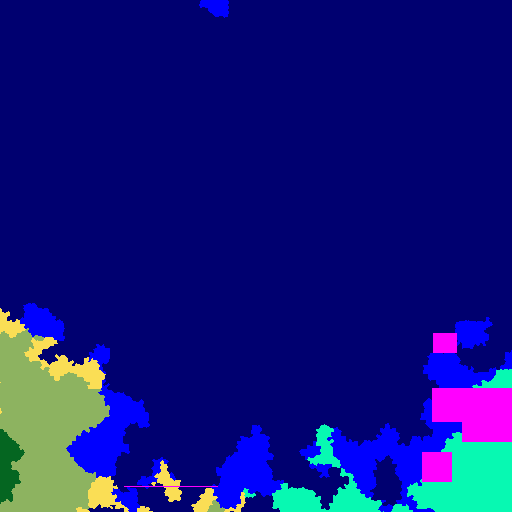 But it's not the most significant place either and if the chunk can be replaced with new landmass (?) for benefit of all I may give it up after mining my structure there. I didn't mean to keep a whole chunk of water! I'm not that selfish! Is relocation easier when it's nearby? I wonder if it could be shifted directly over into the chunk with my castle? Or far east there's that chunk with a lot of open sea. 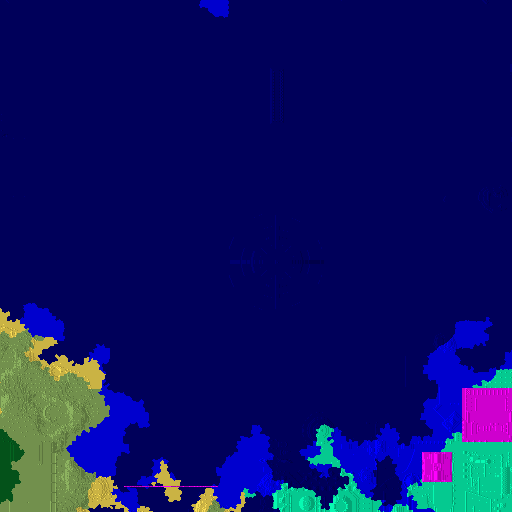 If the chunk were regenerated it would still be all water, just with extra kelp. Well … is there anyone wanting a sea with kelp? Sounding like it's more trouble than it's worth to do anything at this point. Probably best to either stay there or abandon it and start building elsewhere. The bad news I found yesterday is that unless you want to salvage a very small piece of your island (the built-in clone command is restricted to a tiny area size), we're just SOL because all the popular world-editing tools are still trying to catch up with the 1.13 release. Forge would be our best candidate, but it's still in progress. MCEdit could a decent second option, but its community is split among two major forks of the app, and nobody seems to be making progress towards 1.13. So, uhhhh… in related news, upon seeing the lagging state of these major community-driven tools, last night I decided to start writing some of my own from scratch. 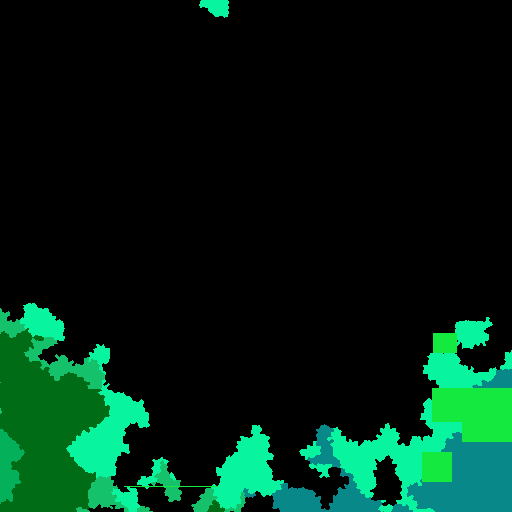 My first goal is to be able to redraw biome data. I wrote a Forge plugin long ago for us to do that via server commands, but this time I'm going deeper and writing a program to rewrite the underlying world files themselves. This means having to make offline edits, which is not ideal since it requires a brief game server restart whenever I make changes, but it's the best I think I can do until Forge is ready again. So far I have successfully built code to parse the biome data out of the 1.13 region files and save the data as an image. I've been testing on this particular region file because I know it has a few areas I had modified the biome data using the Forge plugin. Those are the bright green rectangles in the lower right! Next step is to get this to read from another image and write the updates back into the world. A future goal may include moving whole chunks or their contents around, which brings us full circle to what got me started down this rabbit hole, but that's a much bigger task, and honestly I don't think I'll get far into that before running out of steam. Because a certain farm only works in a certain biome and I'm certainly looking forward to building it closer than said biome currently is to town. Nice work Brad! Hope you are able to make it happen. You bring up the point though that a lot of the modders seem to have fallen away and no one seems to be picking up the gauntlet. Since all this mod stuff is free, and since MC doesn't seem willing to offer compatibility support going forward, why on earth anyone wastes their time with any of it is beyond me. But thanks to those who do [Brad]. I know this isn't exactly what you were asking about, but with Thanksgiving being just a couple weeks ago, I thought it would be historically relevant to share part of the post that marked the start of the free software movement... waaaaay back in 1983! This would lead to Linux a decade later and the incomprehensibly giant ecosystem of free and open-source software we have today. money, programs and equipment are greatly needed. People like myself and these other modders just love building software tools to solve problems (I do it all day at work, and then I do it even more when I get home! ), even (or sometimes especially) if said tool's shelf life is dictated by circumstances beyond our control, and we all in some way subscribe to Stallman's "golden rule" manifesto about sharing our creations openly. Eureka! I think I may be on to something here. After dumping most of my weekend into writing and debugging this dumb little program, I think it's actually reading and writing biomes within the 1.13-format Anvil region files. If the colors look similar to mine, that's to be expected! I'm pretty sure we stole our color palette from the same source. The replaced region file loads and plays in Minecraft itself (locally, not on our server yet), and I haven't been able to find anything missing or broken yet. That's a good sign! 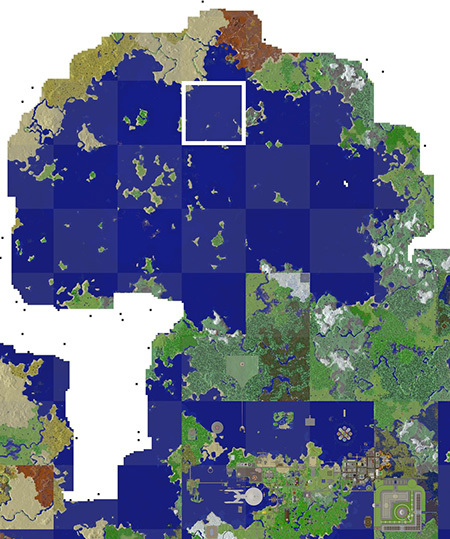 So, I might start taking occasional requests for biome changes, say, if 709 or Ken are hungry for any nearby adjustments. Does this work for the new water biomes in 1.13 (frozen, cold, lukewarm, warm)? Minutor doesn't look like it's updated for 1.13 so you might not be able to pre-test it without a real world test. 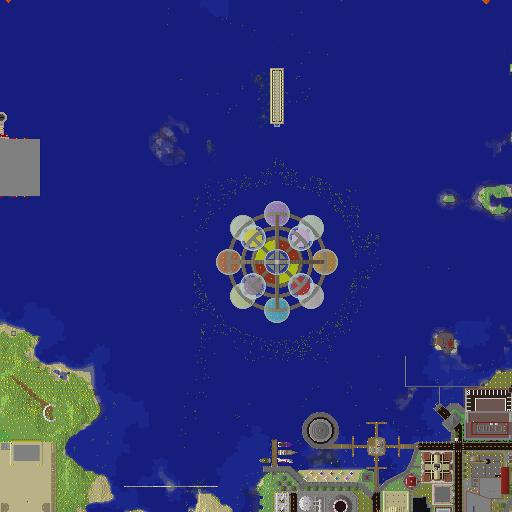 I'm hoping to change part of the ocean near 'topia to warm so I can build a small coral fan farm.